Professional rug cleaning keeps your rugs looking as good as the day when you first bought them. Picking the perfect carpet cleaning company is essential to your rug cleaning. KIWI is a company that has 30 years of experience cleaning rugs and hundreds of thousands happy customers, making us an incredible choice for your rug cleaning. KIWI’s rug cleaning services are the absolute best in Copperfield. Our rug cleaning team is unmatched in the industry and consists of a senior rug expert, a master rug weaver, and a fringe surging and binding specialist and highly skilled and trained rug cleaning technicians. KIWI also uses a hand washing method that allows us to clean your rug delicately and effectively without causing any dying bleeding. Our customer service representatives and our technicians are always happy to answer any question and assist in whatever way we can. 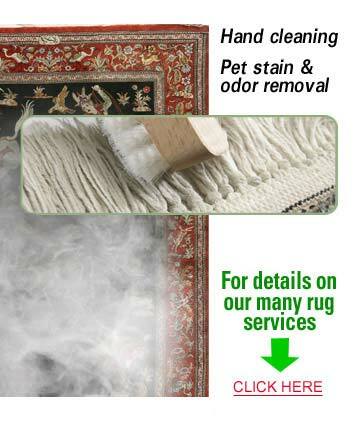 We also offer free pick-up and delivery for the rugs we clean. KIWI offers an extended 30-day clean guarantee that allows you to get a complimentary re-cleaning if you happen to run into any problems. With all of this, it’s no wonder we are Copperfield’s most trusted cleaning company!